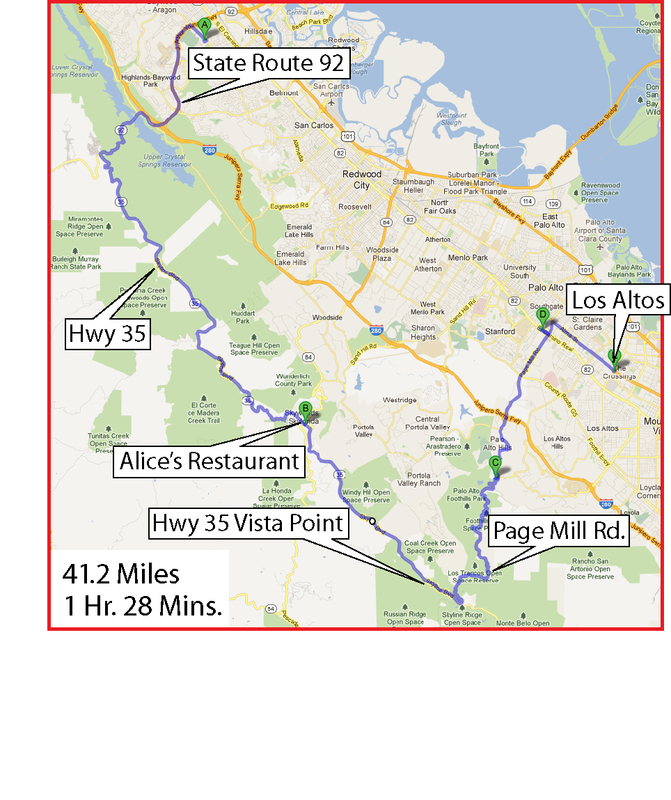 In part one of my series on “secret” commutes to Silicon Valley, I focused on taking country roads from San Mateo to Los Altos through Portola Valley. Doing this made me realize that half the fun of going to work really is getting there! 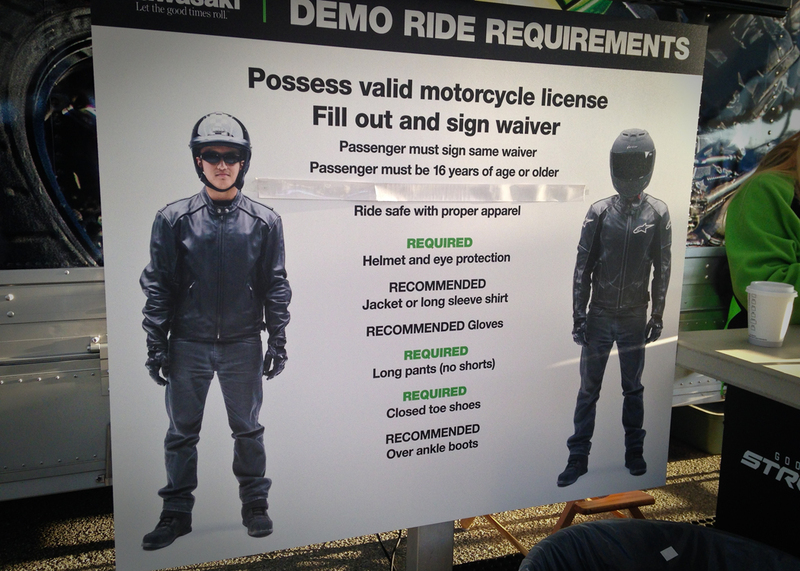 So I looked for ways to venture even further away from the freeway in search of the perfect motorcycle commute. I found it on Highway 35, known locally as Skyline Drive which tops the mountain ridges that separate the San Francisco Bay to the east from the Pacific Ocean to the west. 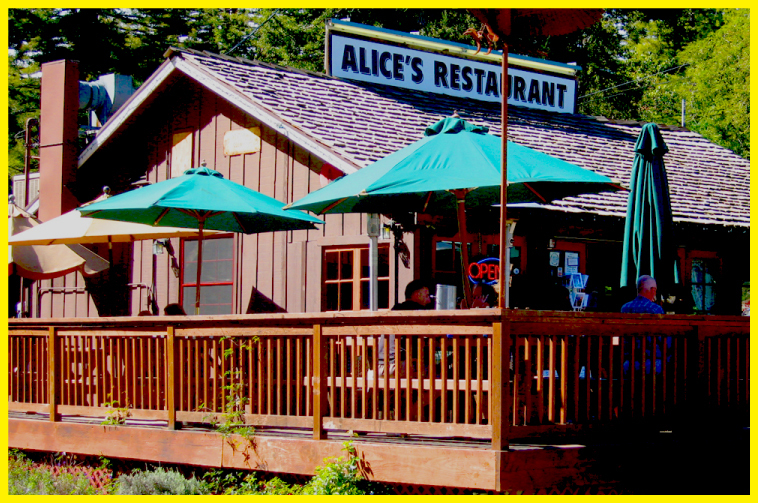 Long fabled as a tremendous weekend motorcycle road, Skyline Drive is also home to the storied “Alice’s Restaurant” in Woodside, California. Not the Alice’s Restaurant of the famous Arlo Guthrie song—that one is in Massachusetts— but the one on Skyline Drive has been a local haunt for motorcyclists, writers and poets since the 1960s. 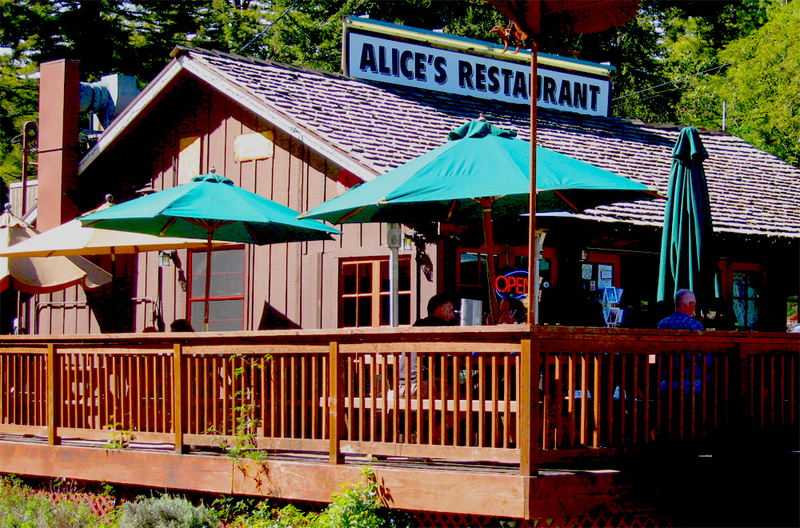 Alice’s is not only a great place for coffee or a meal, but it is the juncture of a number of roads that lead off to their own versions of motorcycle nirvana. But for me, since I was just trying to find a new way to get to the office, I kept riding south past Alice’s towards Page Mill Road. Just before reaching Page Mill, there is a great vista point that looks out over all of Silicon Valley. I love stopping here to think about the cornering technique I just exhibited—both good and bad—while looking down on Stanford University and the rest of the land of startups below. This particular day, it was foggy when I first arrived on Highway 35 and then cleared up into beautiful sunshine atop the ridges. From the vista point, however, I could see that the entire valley was covered in thick, wet fog—waiting for me to descend down into on the way to my office. The fog layer was about 500 feet below the vista point elevation and it looked like I was in a plane flying high above the clouds. What a difference a day makes: photos from my AM & PM commutes that day. It was sunny atop the Highway 35 vista point both morning and afternoon. I took the same route home that day so that I could compare A.M. and P.M. commute photos from the same vista point. The San Francisco Bay Area is famous for its many microclimates. Layering in mountain elevation into the mix helped me encounter fog, sunshine, drizzle, and high overcast all within a forty mile ride in ninety minutes. Crazy. Page Mill Road gets very twisty for about nine miles, throwing in a few 15 mph decreasing-radius blind curves just for fun. That’s better than any Starbucks Coffee for getting your heart pumping in the morning! As I headed down into the dense fog, getting into a back-and-forth rhythm to match the turns, I reflected on how great it was to get a ride like this in before starting my work day. It reminded me of how TV’s Flipper would save Bud and Sandy from whatever underwater mishap befell them—and it was always over before school started! After a while, Page Mill Road’s curves straighten out as I emerged out of the hills and down onto the floor of Silicon Valley in Palo Alto. I decided to go straight down Page Mill to El Camino instead of taking my normal route on Arastradero Road and then through residential streets, just to mix things up. After a quick jaunt down The King’s “Highway”—now festooned with traffic lights every few blocks—I arrived at my office: 41.2 miles and 88 minutes after starting. Considering this “secret” mountain ridge commute to Silicon Valley only took an additional 16.6 miles and 37 minutes than my normal backroads route, it provided some great morning meditation in preparation for slaying the daily dragons at my workplace. Ask yourself, might you have a “secret” commute that could help you shed stress and arrive at your desk with a smile? Open up Google Maps and check it out. You never know what you might find. These are mountain and backcountry roads and are not ideal for motorcyclists who always feel the need for speed. I’ve seen plenty of CHP on this commute and they take a dim view of knee draggers while they are sipping morning coffee in their cruisers. You can have a great time staying within the posted speed limits while enjoying the back-and-forth rhythms of twisty mountain roads. Since this route adds significantly to your commute time, it fails as the shortest distance between point A and B. But if you are looking to feed your inner chi before having your chai tea, you might just look into adding to your commute instead of splitting lanes to make it shorter. 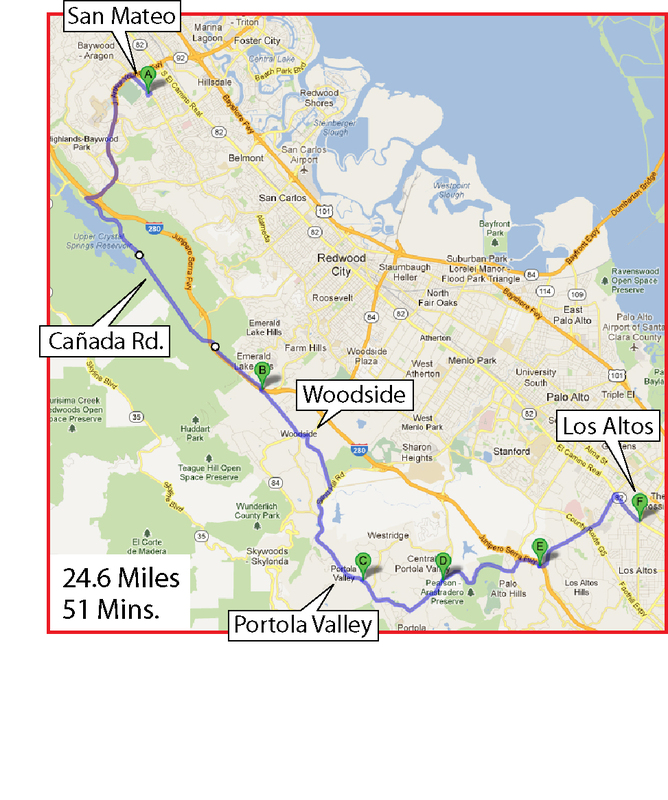 Every day, I ride to work from San Mateo on San Francisco’s peninsula to Los Altos in Silicon Valley around 20 miles away. I’m lucky enough to have multiple ways to get to work, and up to recently, I thought I had tried them all. My primary route uses Interstate 280, known as the world’s most beautiful freeway. It’s a 26 mile jaunt one-way that has rolling hills, lots of gentle curves, wide lanes and beautiful scenery (for a freeway, that is). But when the freeway is flowing, if you’re not going 70+ mph, you’ll get run over. Or, if the traffic is heavy, you’ll spend more time with your feet on the pavement in bumper-to-bumper traffic than with feet on your pegs. My secondary route uses Interstate 101, 70% of which has motorcycle-friendly HOV lanes (high-occupancy vehicle—a.k.a. carpool—lanes) on my 21 mile commute to the office. It’s an ugly freeway hemmed in by ivy-covered sound walls, narrow lanes, and plenty of highway patrol officers looking for cell phone and carpool lane offenders. On Interstate 101, if you don’t get killed by someone changing lanes, you’ll experience a near-miss from another motorcyclist splitting lanes at 15 mph faster than the flow of traffic. To say it’s a “heads-up” route is an understatement. The shortest route for me follows highway 82, the venerable El Camino Real (The King’s Highway). At 14 miles door-to-door, it’s the most direct of the three, but by far the slowest and least enjoyable because of its many traffic lights. On the bright side, it has plenty of places to stop for breakfast or coffee, but it is also the route I name most likely to result in a premature death because of someone running a red light or making a left turn without warning. Now I’m certainly not afraid of the freeway, but being required to exceed the posted speed limit by 10 miles an hour just to stay ahead of traffic pressure is not my idea of a leisurely commute to work. And, lately, the density of the morning commute on I-280 has all-too-often devolved into 25 mph bumper-to-bumper traffic which is definitely not enjoyable. 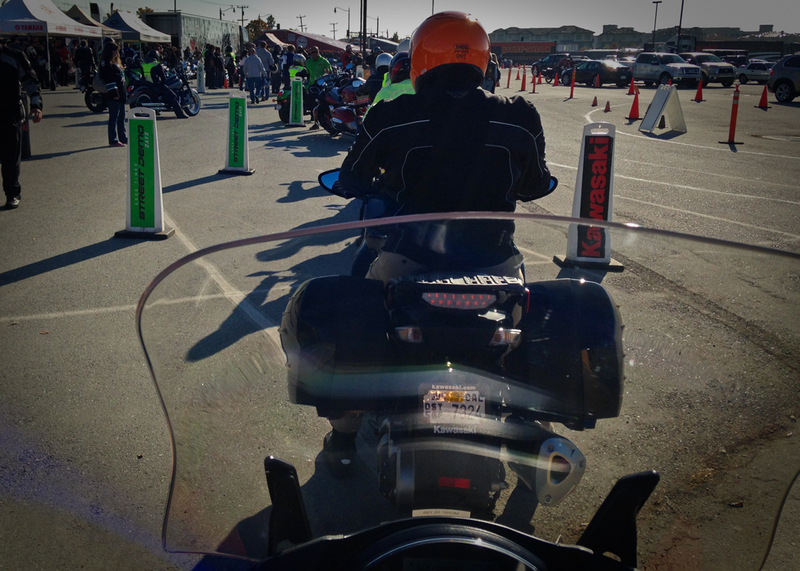 Some motorcyclists enjoy white-line fever, splitting lanes and leaving slower congestion in their wake. I, for one, believe that you decrease your good karma significantly every time you split lanes. I also wouldn’t be at all surprised if the daily motorcycle accidents I hear about on the radio weren’t directly correlated to aggressive lane splitters. About three months ago, I started wondering if there were options other than Hwy 101 or 280 and started to go exploring. I started carrying my camera rig in one of my saddlebags because the weather was exceedingly beautiful and if I could get some good shots on the way into work, well, so much the better. 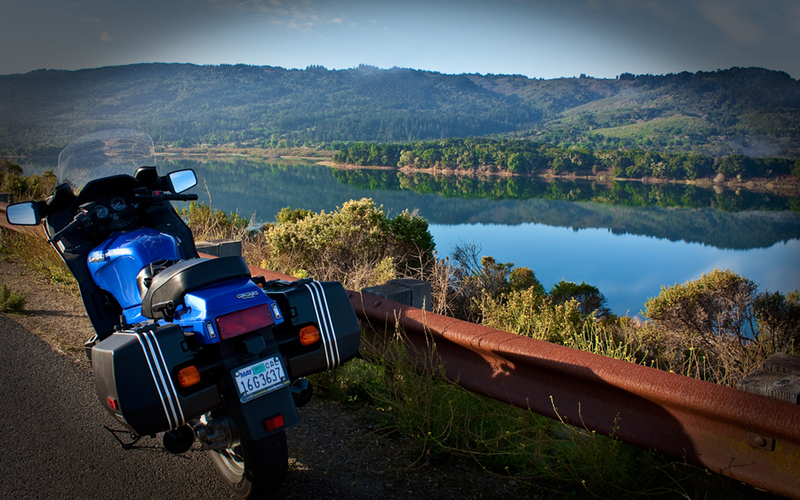 And although I never anticipated that one of my favorite bicycle roads that paralleled I-280 could be a serious candidate for a new motorcycle commute, it did run alongside a miles-long reservoir and provided very photographic scenery. So without further ado, I hopped onto State Route 92 and turned left onto Cañada Road. On this first day of exploration, I saw that Highway 280 up ahead of me had very heavy traffic, so I was glad to be venturing out onto an alternate route. I had only traveled on Cañada road on my bicycle up to that point because they close the road to cars on Sundays. Along this route is the Pulgas Water Temple, the Filoli Estate and Crystal Springs Lake which is where San Francisco gets its water—pumped all the way from Yosemite’s Hetch Hechy reservoir. Cañada road contains beautiful scenery and a few very nice sweeping 50-mph curves before straightening out. The road crosses under Interstate 280 and then runs parallel to it, so you can see just how bad the traffic is on the Interstate. The final few miles degrade to a 35 mph speed limit with three stop signs terminating on Woodside road. A nice distraction at this junction is either the Woodside Bakery or Buck’s Restaurant, where commonly you can hear an entrepreneur pitching a venture capitalist over breakfast. 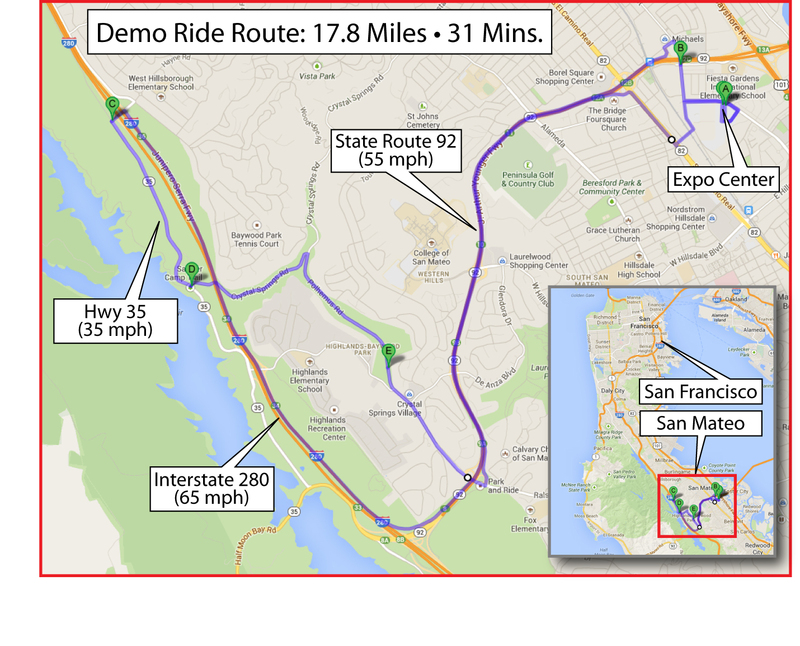 There are a couple of ways to proceed towards Silicon Valley from Woodside. My favorite is to turn left onto Woodside Road and then make a right onto Big Whiskey Hill road after two blocks. Alternately, you can go straight past Roberts Market onto Mountain Home Road which is a picturesque 25 mph road through expensive Woodside estates. I usually opt for the 35 mph Big Whiskey Hill route because it is faster and has more sweeping views of horse farms. Two miles later, you turn right onto Sand Hill Road which becomes Portola Road a few hundred yards further on. The speed limit increases to 40 mph and you wind through a nice two-lane country road bordered by ranches, farms, estates and vineyards. 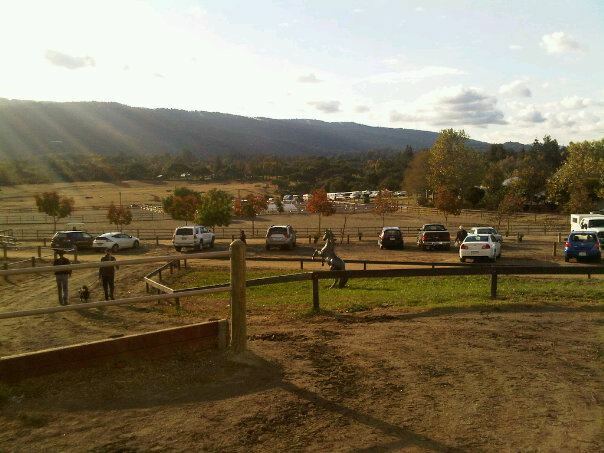 After about three miles, you enter the quaint and quite wealthy town of Portola Valley. I say quite wealthy because I looked online and found that in 2009, the aggregated income per household was almost half a million dollars annually. Portola Road tees into Alpine Road where you want to turn left and head back towards the direction of Interstate 280. 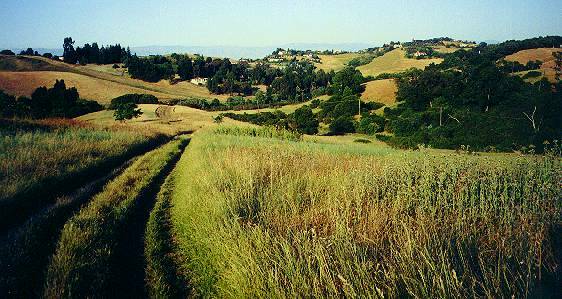 After a few miles, I saw a sign for Arastradero Road which I know crosses El Camino Real near my office, so I took it. What I found was a tremendous road that crosses the Arastradero Preserve. Not only does this road provide enough twisties to be interesting, it dead ends on Page Mill Road which is a major artery into Palo Alto. This is an area where you need to go slow, however, since there are hikers, horses and wildlife. On Page Mill Road I turned left—northeast—and found that Arastradero Road continued off to my right once again just before reaching I–280. I made the right turn back onto Arastradero Road and found that it wound through Los Altos Hills and offered me multiple final routes to my office, either by continuing all the way to El Camino Real, or by turning right onto Foothill Expressway and then winding through residential streets to my office. What I also got by taking this “secret” commute to Silicon Valley was less anxiety, more ability to think about my workday ahead, and the incredible smells of country roads including eucalyptus, grass and pine. I heartily advocate seeing if there are back roads like these that could spice up your daily commute. I would have never thought I could have found a plausible alternate commute if I didn’t open my mind to go exploring on a workday. So leave a few minutes early. Don’t schedule any meetings or conference calls for the beginning of your day. 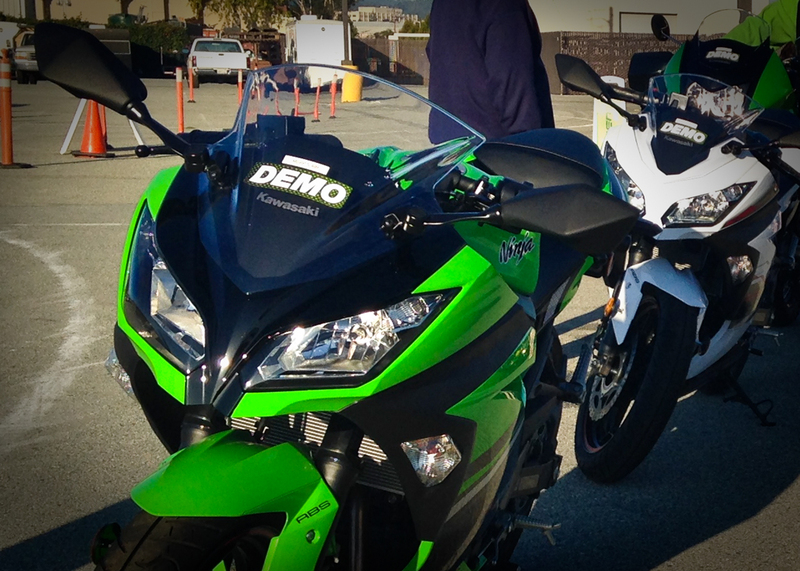 Learn how to use your motorcycle to turn an ugly commute into a great ride. The real “secret” is that you get to make this ride every day…twice! Shhhhh…don’t tell your coworkers why you are smiling. These are country roads and are not ideal for motorcyclists who always feel the need for speed. I’ve seen plenty of county Sheriffs on my commute and a couple of CHPs, as well. They take a dim view of side-road shenanigans. So if you can stay within the posted speed limits and truly enjoy the beautiful sounds and smells these roads can offer, give them a try. 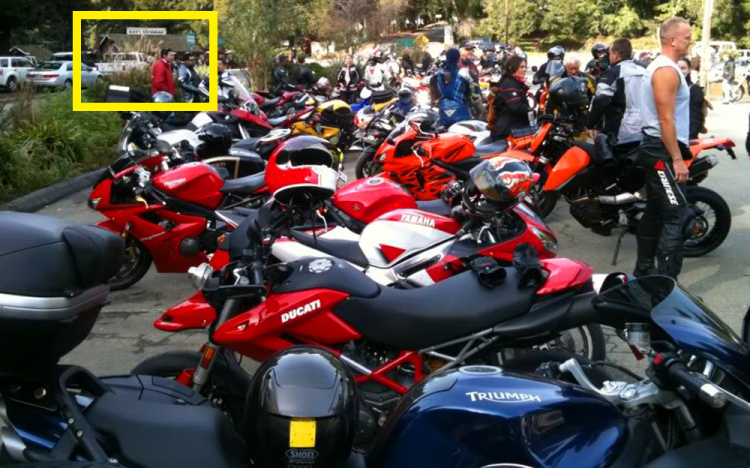 If you are merely looking for a short-cut, stay on the freeway and split lanes like all the other biker banshees. 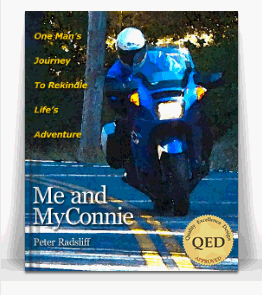 I wrote most of the post above only a few months after I got back into motorcycling. As I reread it prior to finally finishing and posting it I remember how much more anxiety I had back then cruising the freeways during commute hours than I do now. 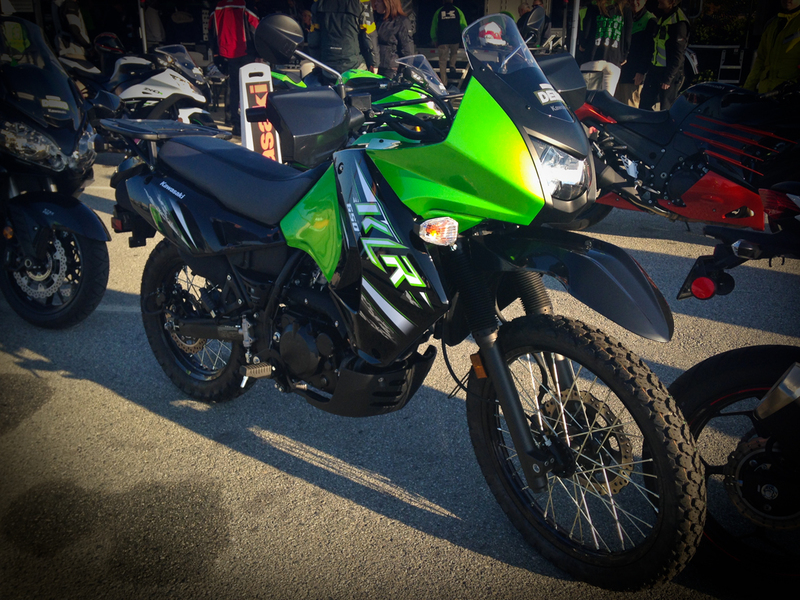 For others of you who are considering getting back into motorcycling after a long hiatus, I can tell you now after a year back in the saddle: it gets better. I had been following Dan’s journey of getting back into motorcycling on Facebook with some interest, especially when he built his own café racer from a sweet ’77 BMW R100/7 which was featured in Iron and Air Magazine [ link to article ]. So when I received his text message, all I could think about was how fast I could install the new Motion Pro speedometer cable I got from Murph’s Kits and get on the road. I checked in with my boss (the wife) and responded to the text that I would meet him at a local watering hole parking lot in Novato in a couple of hours. The previous Monday I had noticed that the cable had come loose from the speedometer gearbox on the front fork and apparently the inner rotating cable had fallen out somewhere along the road. So I temporarily reconnected the dangling cable but was left with no working speedometer. I read my Kawasaki and Clymer manuals and found no reference to the speedo cable, so I resorted to searching the Concours Owners Group Forum pages, where I should have gone in the first place. There I found a treasure trove of information that told me what to buy, where to buy it, how often it breaks, and exactly how to replace it. I have easily gotten more utility out of my $30 annual COG forum membership than what it cost for the manuals. Having no indication of miles per hour made for an interesting commute that week. I found that needing to know my precise speed was largely unnecessary and interestingly…freeing. I could estimate my speed closely enough by reading my tachometer, following the flow of traffic, or just using the ol’ Mark I Eyeballs. But I also found that I was more relaxed and instead of fixating on maintaining a precise speed, I just kept my concentration on the traffic around me being sure to go neither too fast, nor too slow. It could be that I had been so intent on not getting a ticket that I had lost the feel for the road. That’s funny since I’m the guy who is always in the 3rd lane watching the other bikers fly by at 80 miles an hour in the fast lane. Whether or not I would continue to monitor my speedo as closely as I once had, I followed the advice of my fellow Connie owners which made the new speedo cable installation a snap. After snugging up the new cable ends, I buttoned up the fairing, packed the saddlebags with various and sundry items for a day ride, and headed north. One thing that must amaze visitors to the San Francisco Bay Area are its micro climates. I left my home in San Mateo where it was overcast and between 55 and 60 degrees. As I headed into San Francisco, it was positively wet from heavy drizzle…actually, very heavy fog. There were large drops of water dangling from the upper lip of my face shield and I had to use my forefinger as a wiper blade. Luckily, the MyConnie’s more than ample fairing kept my legs and torso dry as a bone. When going across the Golden Gate Bridge the weather could be best described as 50 degree sideways-blowing pea soup fog. And it wasn’t until Novato that it cleared back up to 60 degree overcast without any undue wetness. Soon enough, it would become sunny on the way to the coast, followed by a foggy coastline, and then 85 degrees and sunny heading through the redwoods back to Highway 101. Vacationers not use to these wild swings in temperature and wind chill have funded an entire industry of novelty sweatshirt manufacturers and vendors on Fisherman’s Wharf. 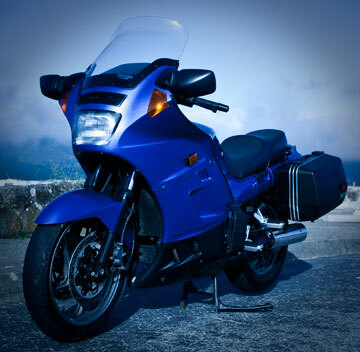 But when on a motorcycle trip to Northern California, suffice it to say that a vented jacket with thermal liner plus extra layers in your saddlebag are an absolute must. After an hour’s trip north through San Francisco and then through Marin, I arrived at Moylan’s Brewery in Novato, about 23 miles north of the Golden Gate Bridge. I filled up with gas across the street and then Dan rolled in and did the same. After admiring the touring bike he decided to choose from his stable, a ’70s-era BMW R100RS, we headed north on Hwy 101 towards Russian River Road. Or at least that’s what we thought. Upon entering the freeway, we immediately ran into traffic that was completely stopped for as far as the eye could see. We later found out that there was a fatal accident from someone who ran off the road about five miles ahead, and the CHP were taking measurements and cleaning up the mess while holding back the traffic to a crawl. All I knew was that Dan made a snap decision, which was really the only one for us to make, which was to split lanes and head up the road. What he didn’t know is that I don’t really split lanes. MyConnie is pretty wide with her saddlebags, and I believe it just infuriates motorists to see motorcyclists make progress when they can’t. So I don’t like to create even more pissed-off drivers bent on killing me, therefore, I don’t split lanes. However, in this case, I really had no choice. If I decided to not split lanes I would have lost Dan, left him waiting for an hour up the road, and been branded a moto-wimp worthy only of a Vespa. And, MyConnie would surely have overheated and then I would have been stuck on the side of the road in the midst of a five mile long bumper-to-bumper nightmare. So, I screwed up my courage and headed forward between the stopped cars. 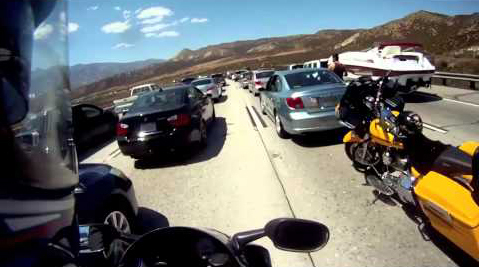 What lane splitting looks like from another rider’s viewpoint. What surprised me is that it was easier than I thought. I just had to keep a loose grip on the bars and stay incredibly focused on the obstacles ahead which included pickup trucks with dualie rear wheels, a bus, a truck, and innumerable SUVs with extremely wide mirrors. I found that the trick was to not move too fast in relation to the surrounding traffic. Also, to keep a keen sense of what the people in front of me are doing, like which ones will move left to see around the car ahead or the ones on their cell phones. This is what I usually do while riding on the freeway, but in this case it was even more important since I was less than a foot away from the traffic on both sides. I made it through the entire five-mile jam without any problems and moved into a lane when I approached the CHPs at the front. Although lane splitting is not illegal in California, it is also not expressly legal, either. So, not being one to push my luck, I became a full member of the traffic jam for the last 50 yards. Once past the horrendous skid marks and crumpled guard rail, I saw Dan waiting on the roadside and we both continued on to Russian River Road. River Road has a number of small towns that dot its length which are reminiscent of ’50s-era beach resorts. These are the resorts that San Franciscans visited to beat the summer chill (yes, you read that correctly) and many had second homes along the flood-prone Russian River. It was an idyllic ride with long sweeping curves, quaint and picturesque towns and sunny temperate weather. It took us about 45 minutes to travel the 29 miles from Hwy 101 to Jenner where the Russian River empties into the Pacific ocean. Once at the coast, we took Highway 1 north along the Sonoma coast. This is a truly breathtaking road that will challenge your cornering skills while providing incredible views of the Pacific ocean far below the bluffs. On the day we made this trip, riding was made a bit more challenging with the addition of fog. 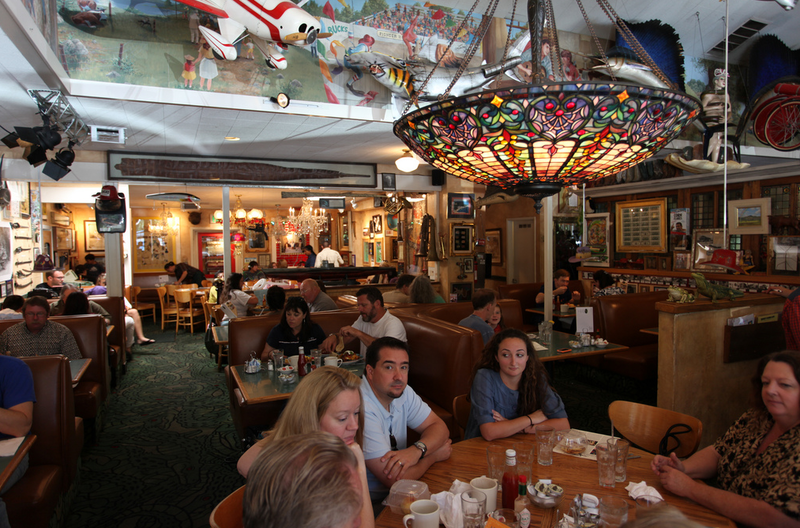 However it wasn’t too soupy, and without any problems, we made our way to the Timber Cove Inn for a sumptuous lunch. After the requisite photo standing next to our bikes taken by a kind stranger in the parking lot, we decided to head much further north and cut back over to Highway 101 via Highway 128 through the redwood forests along the Navarro river. 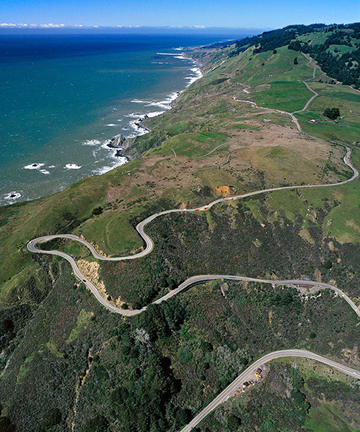 Highway 1 along the North Coast is a combination of challenging curves mere inches from 100 foot cliffs and meandering roads through windswept ranch land. It’s hard to explain its rough-hewn beauty. On the few days that are without overcast, it is a wonder to see and a great place to gain further skill in cornering on a motorcycle. Recently, I purchased Keith Code’s “A Twist of the Wrist II” instructional DVD. It is nicknamed “the cornering bible” for good reason. Watching it before, and after, this trip helped me better my cornering technique and made me realize some things I had been doing wrong. Practicing and improving my cornering skills is one of the reasons I love riding the North Coast. The other, is for the sheer beauty of the ride. I had never ridden north of Salt Point State Park, my favorite abalone hunting ground, so I looked forward to the next jaunt up past Point Arena to the Navarro River. 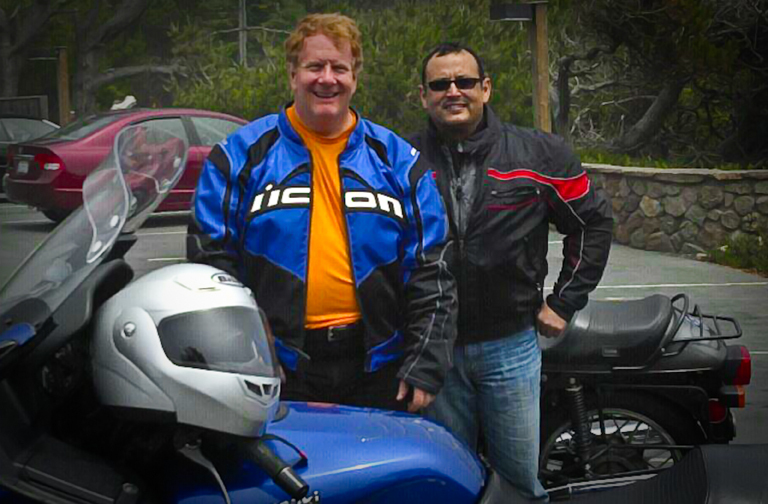 What I didn’t expect was to be in the middle of a redwood forest on an idyllic motorcycle road. 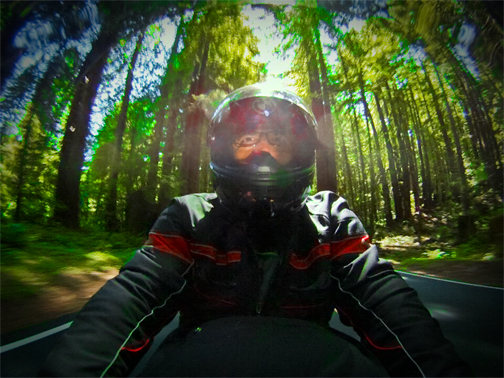 As this GoPro Hero2 photo of Dan on his R100 shows, the stately redwoods filter the light coming through the canopy and produce a surreal landscape. As we continued on our journey back towards Highway 101, the temperature started to heat up the further we got from the coast. We passed through the cute little burg of Boonville and ultimately passed by Cloverdale on the way to Healdsburg to gas up our trusty steeds. Although Dan’s Verizon smartphone had enough service along the route to post and tag trip photos to Facebook, my AT&T iPhone did not. It wasn’t until I reached our gas stop that I checked in on my phone and found that a dear friend of mine saw the photo above of Dan and I at Timber Cove and he left me a message to come visit him in Sebastopol, a mere 30 minutes away. Dan and I parted company after topping off our tanks and I headed toward my friend’s ranch. It’s funny the tricks that fate can play on a person. I woke up that morning without having a clue what the day held for me. 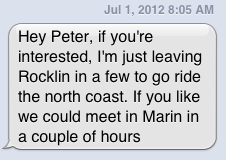 Then a text message arrived and I found myself at the start of what would become a 369 mile ride. I also found myself enjoying the company of a dear friend I had not seen in many a year that by happenstance was going into the hospital to receive another course of chemotherapy the next day. The five hours I spent with him that night were very special to me and served as an important reconnection with a person who has been my advisor, mentor, dive buddy and friend. A person who has played a significant role in shaping the arc of my career. And to think I would not have enjoyed that reconnection without a text message, a photo tagged with my name, and a return Facebook message. This is the value of social media…along with the company of great friends, good roads and our two-wheeled thunderbeasts beneath us. – Roads: Well-paved throughout with a few moments of interest thrown in for good measure such as expansion grates on the Golden Gate Bridge plus cattle grates and periodic handfuls of gravel mid-apex on the numerous180° turns throughout the North Coast section of Hwy 1. 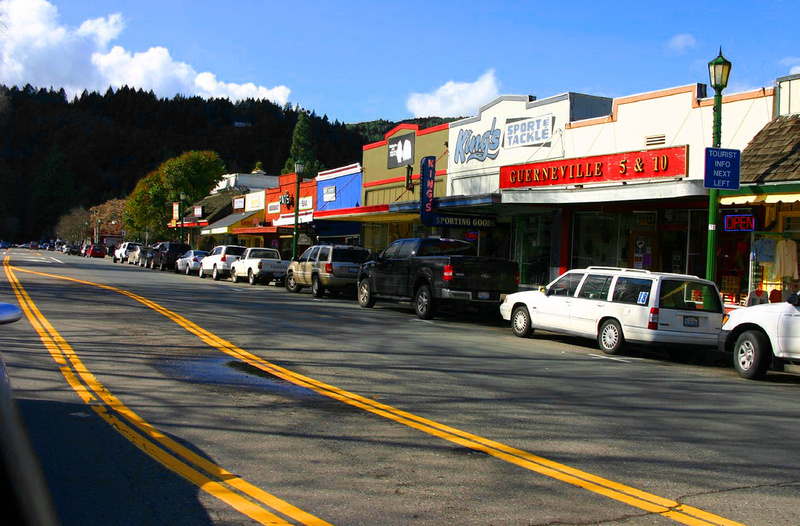 – Scenery: Rustic towns along the Russian River, breathtaking views from the winding cliff roads along Highway 1, and sunlight-dappled redwood forests along the Navarro river. An amazing variety of scenery in one day. – Weather: Highly variable between 55° with dripping fog and 85° heat–and everywhere in between. – Ride: Nice sweeping curves along the Russian and Navarro rivers. Numerous and sometimes tight twisties above precipitous road’s edge cliffs along Highway 1. Be careful and ride within your limits! – Food: Various towns make bringing your own food unnecessary, but a picnic on the bluffs overlooking the Pacific ocean can be a real treat. 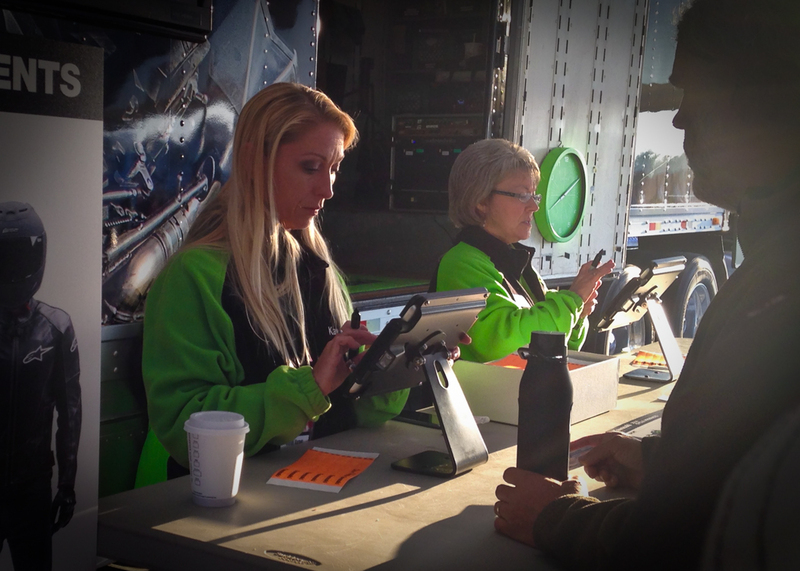 – Gas: There is plenty of gas available in the small towns that dot this route. However, don’t push it—some stretches are 30 to 50 miles between gas stations, so don’t get caught waiting too long to fill up. 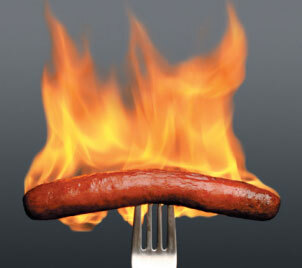 – Rating: 5-stars (out of 5) for overall enjoyment and variety. The ride is challenging but not overwhelming while being incredibly beautiful. 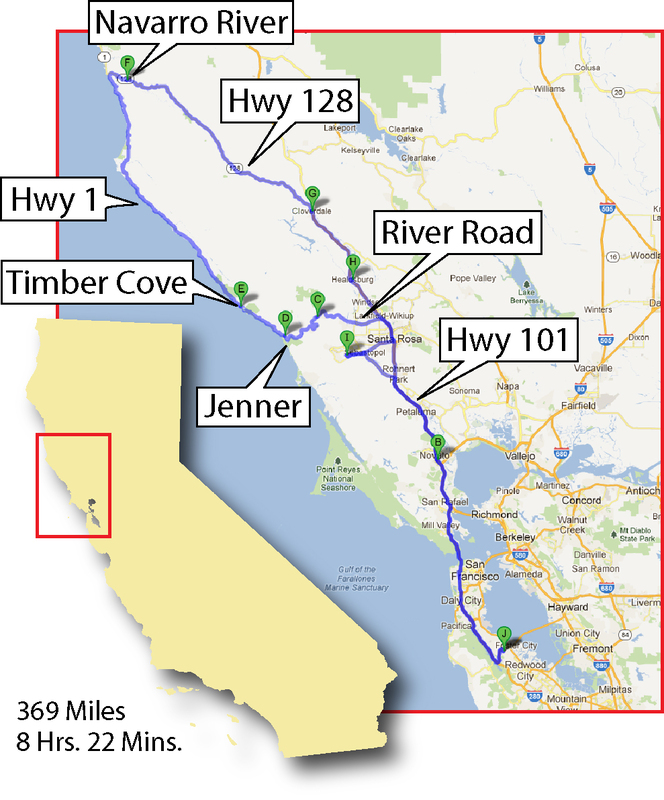 – Additional Fun: Points of interest along the way include the Russian River resort towns of Guerneville, Monte Rio, and Rio Nido–great spots for a dip in the river. On the coast, stop for a tour at Ft. Ross, have lunch at the Timber Cove Inn, or bring your snorkeling gear to stalk the elusive abalone at Salt Point State Park. I don’t know if I meant my blog to have this effect on people, but I received an email from an old friend of mine who said “he was looking to get back into motorcycling.” He was looking at a used Kawasaki Vulcan at a dealership because he wanted to not invest too much until he proved to himself that this was something he wanted to get deeply into. Oh Lord, have I started a wave of “Buy first, ask questions later?” I certainly hope not. But I welcome my friend Mike to the ranks of Connie ownership and look forward to seeing his journey back into riding alongside my own. Okay, down to business. The shine has come off the first few days of commuting back and forth to work. Not because I am unhappy with my Connie — far from it — I am smiling ear to ear. No, now I am experiencing the reality of the daily commute on a motorcycle: wind, noise, road debris, people trying to kill you…you know, the usual stuff. Mind you, I don’t have to commute on my bike, I want to commute on my bike. I’m reminded of Dennis Quaid’s great line in the movie, The Rookie: “You know what we get to do today, Brooks? We get to play baseball.” Well, for me, “I get to ride a motorcycle twice today!” Even with the nuts on their cell phones trying their hands at vehicular manslaughter, it’s a great deal. Especially with northern California weather on the world’s most beautiful freeway, Interstate 280. I’ve done some experimenting in the past week riding with the luggage on and off. I am happy to report that the rear luggage is essentially invisible from a riding perspective. I couldn’t detect any difference at all. Now, I don’t split lanes, and I haven’t been dragging my knees, either. I would imagine the width of the luggage could compromise either of those activities a bit. But for normal commuting, I’m glad I don’t detect any difference. It’s very convenient that the side luggage will hold a helmet and a lot of other stuff as well. I do admit that I prefer the clean lines of the Connie sans luggage. But realistically, on any trip longer than a Saturday morning romp, having the storage is really a necessity. 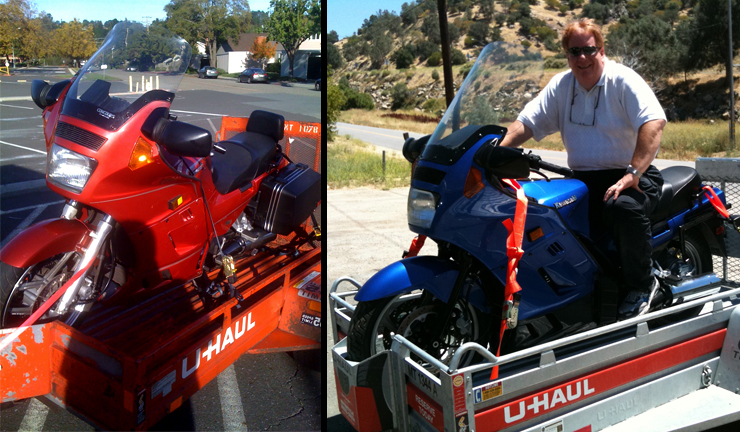 I’ve also compared the stock windshield against a taller/wider one (custom-made) given to me by the previous owner. Although I plan to address windshields more thoroughly in a future post, I can tell you that I like the stock windshield best. This may seem counter to the prevailing sentiment amongst other Connie riders, but here is my rationale. Most of all, I don’t like looking through a windshield while riding. If I wanted to do that, I would drive my car. I might change my tune on an extremely long tour, but for twisties or commuting, being able to look over the windshield to ride is very much preferred. There is definitely more wind noise with the shorter and narrower stock windshield, but I think rider’s comfort level all depends on where they are coming from. If they are Gold Wingers at heart, then the stock windshield is probably little more than a underperforming bug screen. But, if they come from the world of naked bikes, then the stock Connie fairing/windshield is pure luxury. After a few days shaking out the cobwebs commuting at 70 miles per hour, I accompanied my brother-in-law Rich on his brand new Triumph Bonneville T100 on a Saturday morning trip through the twisties to Alice’s Restaurant and then onwards to the coast. My Connie handled like a dream — smooth as silk and held back more by my still-conservative riding style than from any inherent limitation. I donned her sporty persona: no luggage and the stock windshield. …and a great place to ride. 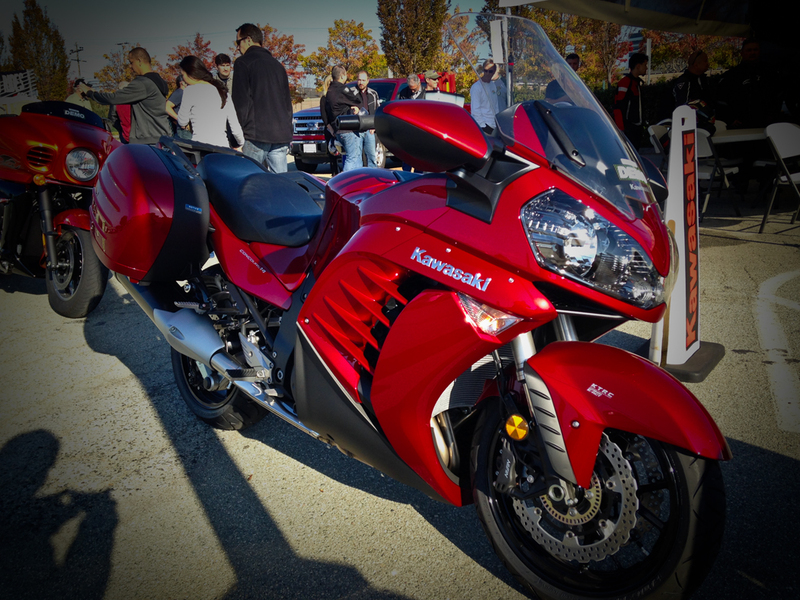 Amidst the various superbikes arrayed in Alice’s parking lot, my Connie and my partner’s Bonnie may have looked a bit misplaced without one bit of carbon fiber or titanium between us. But the only sentiment that I could muster was, “It’s all good!” — especially Alice’s breakfast. Continuing on to the Pacific took us through the misty coastal redwoods on Highway 84 ending at San Gregorio followd by a quick trip up Highway 1 to Half Moon Bay and then the final jaunt home on Highway 92 to San Mateo. So the first week on my Connie was a resounding success. I know my machine better than I did at the beginning of the week, and I know myself better, too.